Naming a baby can be a difficult task in itself, but naming twins can be even more challenging! There are many choices to make when it comes to naming twins. Do you want the names to sound alike, or to not sound alike at all? Do you want the names to rhyme? How will you decide what name to give what baby? Do you want the names to start with the same letter? If you are feeling overwhelmed, don’t worry! 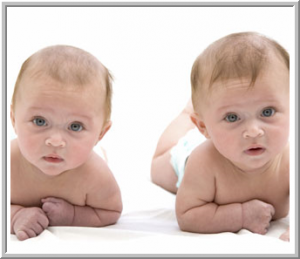 Here are some tips to keep in mind when naming your twins. You can make the twin’s names have a the same sound, for example “Erik” and “Derrick,” or “Jessica” and “Julia.” This keeps the children’s names similar without making them sound too much alike. You can decide to name your twins names that have nothing to do with each other as well. This may be the right choice for you if you do not want to worry about confusing your twins, or if you believe that giving your twins different names could help them feel more distinguished and special. Remember, there are no rules to naming twins, so choose the names that feel and sound right to you!